Early postcards & photos featuring caravans are not easy things to find, so I've only got a few to feature here. If there are any more out there, I'd be happy to feature them within this classic caravans section. 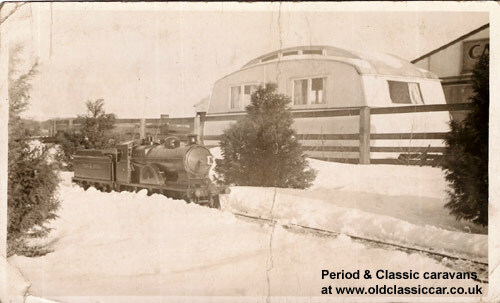 This image that features an old caravan alongside a scale working model of a steam locomotive, must, I think, date to the 1930s or 1940s. On the rear is this handwritten note: "UKP75 now. Beautiful scale model. Pulls about 3 adults - not really for passenger hauling". Obviously the loco was the subject of the photo, but where was it taken? the building in the background has a big sign with the letters CA... - perhaps a caravan dealer? It must be a decent make judging by the lantern roof. Given how snowy the ground is, I hope it has a heater too! John dropped me a note, with some more thoughts on this snowy scene ... "This has been the subject of some discussion on the Miniature Railway Forum site and we can perhaps shed some light on this from the miniature railway perspective. The locomotive would seem to be one constructed in 1898 by the Holder Family of Pitmaston, Moor End, Birmingham who had a 10.25" miniature running the grounds of their house. The locomotive is a model of a Great Central Railway single driver express locomotive designed by Pollitt, the Chief Mechanical Engineer of that Railway. The fact that it was a single driver locomotive would have made it fast but not a great load hauler, hence the comment that it can only haul 3 adults! We are not sure where the photo was taken but as it would seem that the locomotive was for sale maybe at the time of the photograph. That may be just before it came into the possession of one HCS Bullock who was a miniature engine builder and re-builder of some renown at that time. 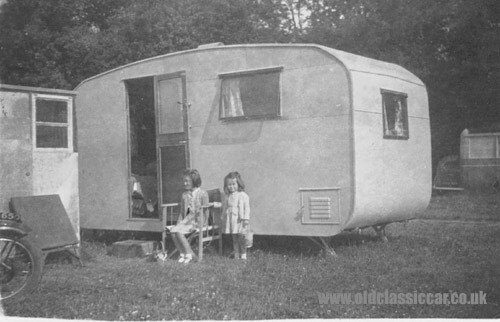 This would place the time of the photograph as being about 1936/7, which would fit with the possible age of the caravan. Bullock is believed to have dismantled the locomotive in 1937. At the time Bullock was also involved with the Surrey Border & Camberley Railway and lived near to Camberley. It seems unlikely that this locomotive would have been used seriously on the SB&C Rly as it would have been too small and underpowered. I don't know whether this photo would have been taken somewhere in the Camberley area hence the two letters that seem to be on the name-board of the building behind the caravan. I don't know if any of your caravan cognoscenti can shed any light on the possible name or owner of the business in the background of this photo, but it may also shed some light on where the locomotive was before it came into the ownership of HCS Bullock which incidentally is currently a blank space in the locomotive's history. I hope that this may be of interest to your readers." Thanks for the information John, if I hear any more on this I'll be in touch. "I think that the top photograph showing the model steam engine may have been taken at Cara-Cars caravan dealership near Ilkley. In the late 60's/early 70's there were at least two model steam engines in glass-fronted cases at the back of the showroom (which I think is the building to the right), and there was a miniature railway line running through the grounds at the end of the showroom - the display cases had doors to link up with the track. I never saw them running, however." Interesting, thanks Martyn, perhaps this information might help clarify the location? This Christmas postcard, issued by Cara-Cars Ltd, and franked 19 Dec 1943, is a curious thing. 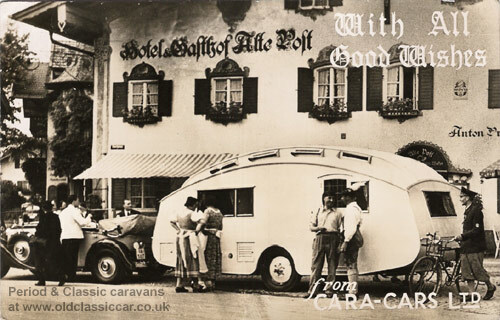 Why would a British caravan manufacturer send out a picture in the UK, during WW2, of a German registered Mercedes tourer towing a Brit caravan? especially as it looks to be parked outside a continental, possibly German (or Austrian? ), hotel. The photo was most likely taken prior to 1939 but it seems an odd choice of view to use. All suggestions welcomed on a, err, postcard! Franked in September 1949 is this postcard which was sent from someone staying at Reeds Holiday Camp, nr Prestatyn in North Wales. 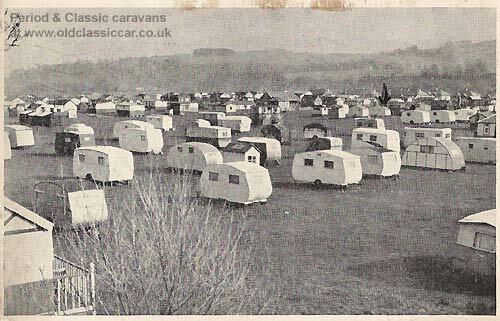 The shape and variety of caravans seen here is amazing. Check out the semi-circular device to the right of this photograph, aiming for the half-timbered Tudor house look I think. Identifying any of these caravans is going to be tricky. Popular makes in the 1940s include Eccles & Bluebird, and there are bound to be examples of both shown here. There is no date on this one alas, but its a fairly safe bet that this photograph was taken in the very early 1950s, judging by the Austin A70 (?) and Mk1 Ford Consul that are in view. The scene is Brough's Beach Camp, in Llandulas North Wales. This photo looks to be a re-touched black and white photograph, I bet the caravans weren't really this brightly coloured. George, of Farlander caravan fame, has been going through some old family albums, and turned up the 3"x2" photos shown below, taken on a Box Brownie no less, which he agreed to being published here..
A very simple rental caravan is seen in this black and white image ..
"... my two sisters on Holiday in a rented van in 1948 at a place called 'Blue Anchor' thats all I have. The bike to the left was my father's Royal Enfield big V twin combination they had at that time, no car then! You wont see it but I could just (with high magnification!) make out the car to the right as being GYD369. No idea what it was though!". 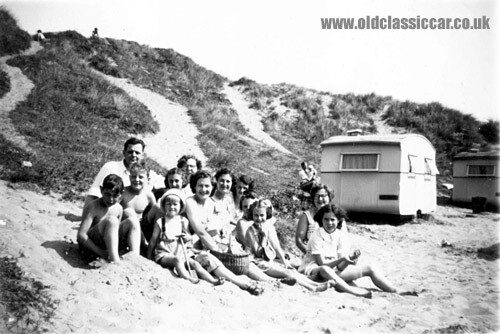 This atmospheric photo shows some of George's relatives & friends at the seaside, c1952. Rules regarding parking were a lot more relaxed than in today's red tape-laden world, and must have made for an easier way of life. No sign in this photo of the cars used to get these vans onto the seashore. 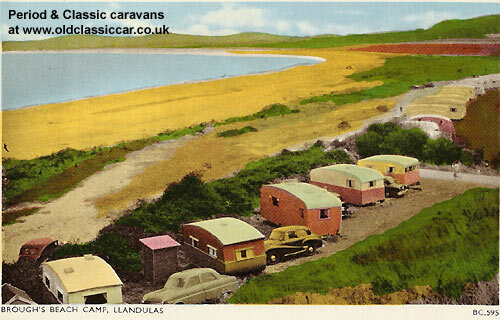 This amazing piccie was also taken in 1952 at the Welsh campsite. Caravans seem to be parked anywhere, and negotiating a car plus caravan amidst this chaos must have been quite entertaining to say the least! Note the interesting little estate car, or 'shooting brake', parked at the bottom right of the picture. We're both a bit curious as to what it is! Chances are it is a home-built job, based on a donor saloon car. A clearer shot of this woodie appears in the Mystery Car Photos section. Final photo shows a 1960s Bedford CA 796 PML parked alongside a caravan, in 1969. In view is George's brother and nephew. The van has rear side windows so might be a CA 'workobus' I think they were called. 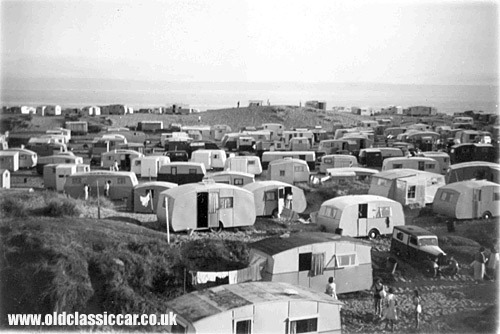 Note how much more organised this late 60s caravan site was than the earlier photos from 20 or so years earlier! The camera equipment had also moved on - the older photos came courtesy of a trusty old Box Brownie, whereas this shot came thanks to a Polaroid camera. 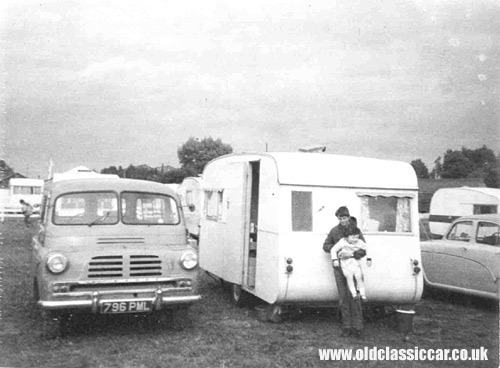 If you have found any exciting old pictures that feature caravans like this, I'd really like to feature them on this page if at all possible.